This deceptively simple gadget will keep your earbuds tangle-free and protected. 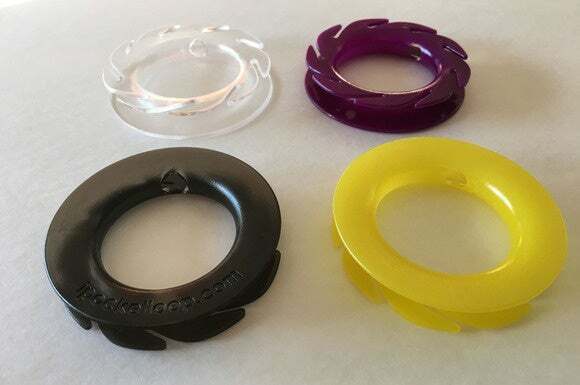 When I received my review samples of the Loop in different colors, what struck me was how simple the design is. The Loop is a donut-shaped circular disc smooth on one side with pinwheel-shaped arms on the reverse and a curved channel in between. The Loop works great with earbud cables that have straight plugs; not so much with cables with angled plugs. Using the Loop is very straightforward: Place the 3.5mm plug at the end of the earbud cable into one of the two holes in the channel, so that it protrudes through the donut hole. Next, wrap the cable around the Loop and fasten the earbuds to one of its pinwheel slots. 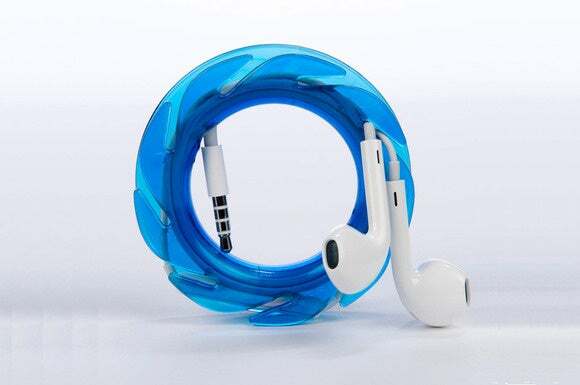 To unwrap it, slide the earbuds from the pinwheel slot and just slightly pull on them with your finger in the middle of the donut hole. Just like that, your earbud cable will spin free and you’ll be ready to jam to your music. Does the Loop really work? I admit that when I received the Loop I had a few concerns. Ironically, my concerns had nothing to do with tangled cables. In fact, my two primary concerns were damaging my earbud cords in the pinwheel slot and having a bulky, uncomfortable disc in my pocket or jacket. To understand my concerns in context, my everyday travel earbuds are the B&W C5 and RBH EP3 in-ear monitors. Each pair retails for about $180. They are not the most expensive earbuds you can buy, but they are significantly more expensive than the stock Apple earbuds. Because they are geared towards audiophiles, these earbuds have slightly thicker cabling, too. The RBH EP3 even has a tangle-resistant cable that makes it a bit stiffer than most. I was also curious to see how well the Loop could protect the earbud cables from strain damage. I cannot tell you how many pairs of earbuds I’ve gone through over the years from high-end manufacturers including Shure, B&O, B&W, and others. Each of them has failed due to cable stress. It became quickly apparent that my concerns were unfounded. The Loop was ridiculously simple to use. I put the 3.5mm jack in the hole, rolled up the earbud cable, and I was done. The 3.5mm jack sat nicely in the donut ring, protected from any easy bending or strain. At first, I was hesitant to lock down the earbuds into the pinwheel arm slots, but I quickly got over that fear. A minor complaint: The rectangular in-line remote and microphone on the B&W C5 and RBH EP3 didn’t sit flush. It protruded just a hair. Even so, it didn’t get in my way. In fact, I wrapped up the earbuds, slid them into my pocket, and to my utter shock, the Loop didn’t feel odd, uncomfortable or bulky. Because of its smooth, rounded, and curved edging, the Loop never felt sharp or got caught on anything. The Loop is available in a wide range of colors. Moreover, if I took care to put the earbud ends properly into the pinwheel slots, the earbud heads never came out in my pocket. I inspected the cabling of the B&W C5s and RBH EP3s, and I didn’t notice any overt markings or scuffing on the outer cable sheath. Only after prolonged storage in the Loop did I notice an ever so slight bend in the headphone cable at the pinwheel pinch point. Other than that, the Loop worked exactly as advertised. It kept my cables untangled every time, and unwrapping my earbuds was a breeze. I did find in-ear monitors that the Loop did not work with. If your earphones have angled plugs, then they likely won’t fit in the Loop. I tried a pair of Etymotic and Shure earbuds and had no luck at all. The Loop was useless with those devices. Finally, there’s the price to consider. You can’t buy just one Loop; you must purchase them in either a three-pack (regular price $20, on sale at the time of my review for $17) or as a 10-pack for $50. At those price points, you’d better be seriously agitated by earbud tangles or plan to give some away as gifts. Stop searching YouTube for this week’s magic earbud-wrapping technique. If you’ve ever uttered the words, “I wish someone would invent a way to keep my earbuds from getting tangled,” then consider your wish granted. The Loop is a keenly designed and extremely simple solution that works as advertised. Though the Loop is a bit on the pricey side, you will find that its quality design and materials—as well as the frustration it prevents—to be well worth the price. Though owners of high-end earbuds may think twice about entrusting their prize possessions to the Loop, for the vast majority of people, the Loop will prove to be a great solution to a recurring problem. Fed up with tangled earbud cables? 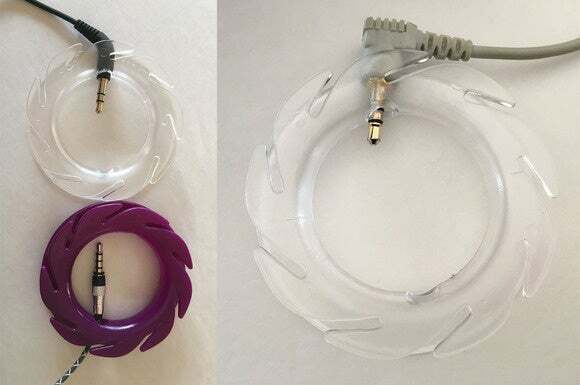 The Loop is an incredibly simple solution that keeps your headphones neatly wrapped and protected even while they’re in your pocket, purse, or backpack.